The Vintage Kitchen, Poolbeg Street. From the Irish Times to le cool, to the 80+ rave reviews on Tripadvisor, the Vintage Kitchen has been one of the most talked-about new places to eat in Dublin this year. Which of course means that any time I’ve tried to get a reservation for dinner there, they haven’t ever had a Friday or Saturday evening table when I’ve asked for one, and I kind of gave up trying a while ago. But, as soon as arrangements were made a few weeks ago for a Tuesday night rendezvous with my favourite dining companions, the Loreto Ladies, we snapped up the 8.15pm table we were offered and started studying the menu in anticipation. The Vintage Kitchen’s BYOW policy has played no small part in its popularity, meaning that you can bring your favourite wine without even paying corkage. I was delighted to see that this also appears to extend into a Bring Your Own Pint policy, with punters arriving in with pints of Arthur’s finest in hand from Mulligan’s next door. Better again, it was only when I noticed our waiter dropping records off at a couple of tables near us that I remembered also reading about their “Bring your own Vinyl” policy, which allows customers to bring their favourite records to spin on the restaurant’s turntable while enjoying their meal. The perfect option for the music obsessive or budding DJ, a potential embarrassment for those of you whose only stash of vinyl is made up of Mum’s old Mary Black albums and a Bosco LP… Thankfully the diners supplying the records on the night we visited had pretty uncontroversial Motown and indie leanings. The menu is divided into ‘Something to Start’, ‘Something to Follow’ and ‘Something to Finish’ – that’s starter, main course and desserts to you and me. 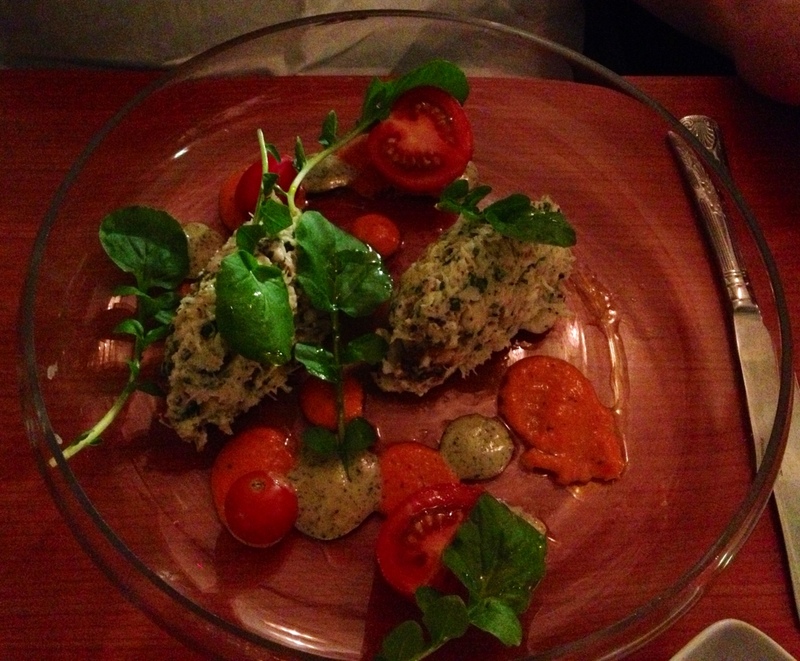 For €25 you get two courses of your choice from the menu, and you can add dessert for an extra fiver. Our waiter advised us from the start to “leave room” for dessert…at least we thought that’s what he was saying, but our hearing may have been muffled by the sound of furious scoffing of the little basket of fresh bread with a creamy fennel butter that he had just dropped off at our table. He got a bit more firm then, refusing our pleas for “more bread please” in favour of us leaving room for the food. I started with “The excellent St Tola (adjective not mine, but I can’t argue with the description) organic goat’s cheese, black figs, Spanish tomatoes, cherry and star anise relish and slow roasted beets,” and what a start it was. 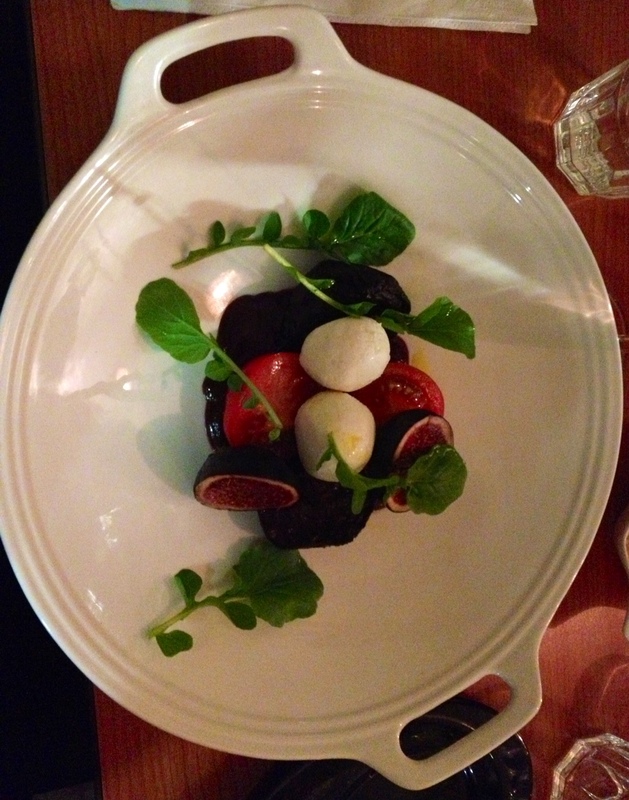 The velvety-smooth little balls of goat’s cheese combined with the beetroot, tomato (two ingredients I would presume never should go together) and the pool of almost-black relish at the bottom of the dish, were a stunning combination. St Tola goat’s cheese and beetroot starter. “House salt cod and Clogherhead crab salad” was the other star starter, also proudly bearing its Irish ingredients in its name. In the case of this dish, I didn’t think the presentation did it any favours, as the array of “blobs” of chili mayo and roast pepper pesto struggled to stand out against the clear glass dish – but the portion was generous enough for everyone to have a taste, and it tasted fantastic. Salt cod & Clogherhead crab salad starter. The other two had fish chowder (Sligo clams and Glenmar house smoked natural haddock chowder, to be precise) with tons of haddock and mussels shipwrecked in many delicious litres of cream, and an unusual dish of roasted and braised Carlow mushrooms, truffle essence, greens and basil milk, which proved worth the risk of ordering something that the rest of us were a bit “ugh” about on paper. When it came to our mains, we mostly chose different main courses so as to sample as much of the menu as possible, trying everything but the steak and veggie options. I never thought I could be completely full from eating white fish for dinner, but as I struggled to finish the last mouthfuls (never let it be said I was a quitter) of my huge, fresh piece of pan-fried Kilmore Quay hake, having polished off all of the accompanying “sautéed Cajun Roaring Bay” mussels and scooped the caviar out of the seashells that topped off this incredible dish, I had to concede that dessert wasn’t going to be on the cards. 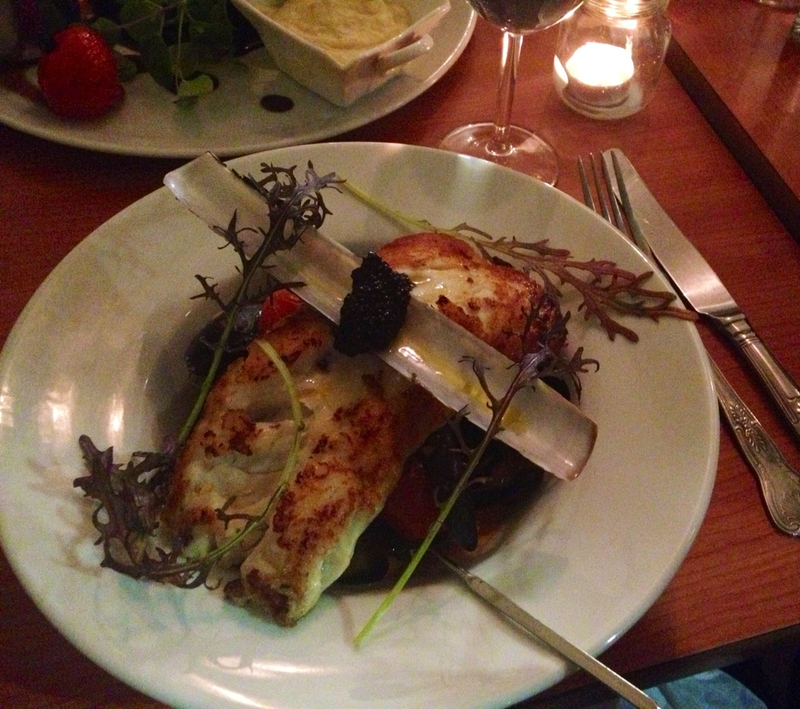 Kilmore Quay hake, caviar, sauteed mussels, organic leeks. I also loved the look of Niamh’s roasted poussin with crispy potatoes, soy and apple gravy with celeriac pot – the latter of which I couldn’t leave alone as I kept stealing forkfuls from across the table (sorry Niamh), and the other main course on our table which was the Slaney River slow roasted lamb shank with treacle gravy, slow roasted carrots and sweet potato mash. None of the four of us had anything but huge praise for all of this food (and we weren’t even availing of the BYOW). 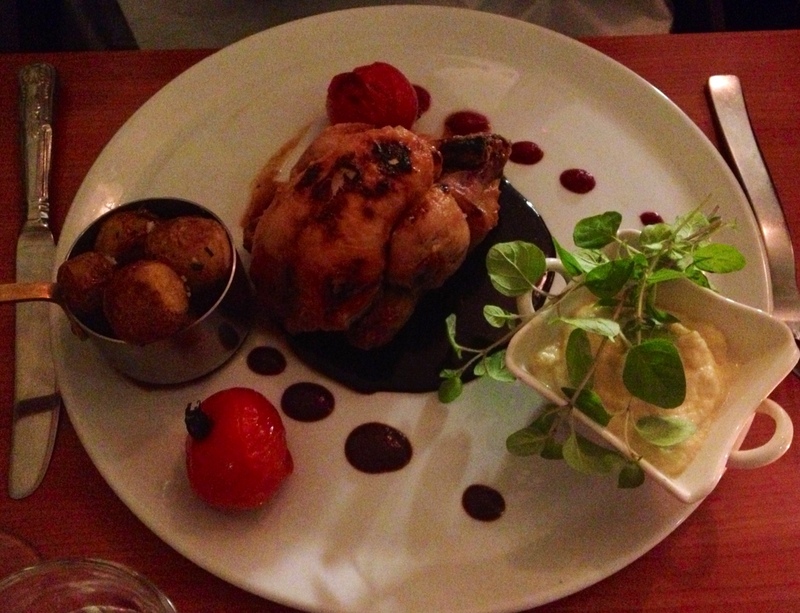 Little crispy poussin (awww) with celeriac pot. Much has been made of the “vintage” decor here, and while it’s definitely quirky, I couldn’t honestly describe it as comfortable. Conditions at our window four-top table were pretty cramped and there was a persistent draught from the window at the back of my neck for the whole night. I wouldn’t put up with it in any other restaurant. But as you might have guessed already, the Vintage Kitchen isn’t really like any other restaurant you’ll find in Dublin right now. The value for money is incredible when you consider that we enjoyed all of the dishes above at a cost of €100 for four people. It’s worth mentioning that two dishes on the night we visited carried a supplement – a relatively hefty €6 for the striploin of beef and another €4 for the cheese plate on the dessert menu would bring the cost of your dessert, if you were to make it that far, to €9. Our friendly waiter (and I mean by this that he was so friendly that my friends thought I knew him, so enthusiastic were the chats throughout our meal) also raved about their lunch menu, which includes the superbly creamy fish chowder and which I urge you try if you’re a Dublin city centre worker. They’re also currently promoting a brilliant value Christmas lunch menu on their website where €25 will get you not two, but three courses, which should guarantee them a full house for the whole festive season. We’re already booked in for the Lovely Ladies Christmas Liquid Lunch, 2013 Edition, where I’m sure we’ll take full advantage of all possible BYO policies. Even though it describes itself as a “pop down to” rather than a “pop-up” restaurant, it feels like The Vintage Kitchen could be a testing ground for chef Sean Drugan, before he moves onto loftier things. So my advice is to take whatever booking you can get, and go there soon. The Vintage Kitchen, 7 Poolbeg Street, Dublin 2. +353 (1) 679 8705 for reservations or visit their website. This place sounds interesting! I intend to visit soon…..